LEN - www.lankaenews.com | Govt. dilutes debate on MR’s colossal US $ 7.6 billion misappropriation based on NY Times report ! (Lanka e News – 20.July.2018, 11.45PM) It was apparent the debate in parliament of the UNP yesterday (19) pertaining to the receipt of a colossal sum of US dollars 7.6 billion by ex president Mahinda Rajapakse from the Chinese harbor Co. during the last presidential elections based on New York Times report was lacking the enthusiasm it merited. Though the debate was to start this forenoon and to continue until 7.30 p.m. the office of the government chief whip did not take steps to ensure the presence of the senior UNP speakers. Only Kabir Hashim and Akila Viraj Kariyawasam were the only senior ministers present to make speeches. .
From the moment the parliamentary sessions began , the joint opposition was determined to sabotage the debate assuming that the UNP seniors were present . The joint opposition (JO) and the seniors of the group of 16 too spoke with the objective of disrupting and disturbing the proceedings while also claiming there was no quorum . The debate which was scheduled to commence at 11.00 a.m. was delayed until 11.50 a.m. due to the JO raising irrelevant issues regarding regulations . These saboteurs disrupted the debate while the government whip office automatically contributed to the dilution of the proceedings. During an adjournment motion , whether it is brought by the government side or the opposition , the government should provide the answer , however since the government whip’s office had not taken any action , the debate ended without an answer. The UNP had a splendid opportunity to score all the plus points at the debate which was not attended by Mahinda Rajapakse , but because the government whip’s office did not take the necessary measures , the entire debate ended deflated. Except the chief whip Gayantha Karunatileke of the government whip’s office , others appointed to assist him were officers of the Rajapakse era . 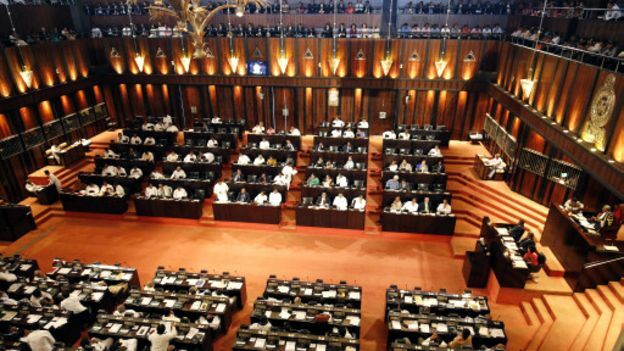 It is why , the debate had to end this way , employees in the parliament lamented while pointing out , the government carrying on even to this extent while having all the Rajapakse lackeys and lickspittles in their midst is a matter for surprise .